Each year, Friends of the Palo Alto Library (FOPAL) receives over 400,000 books donated from local residents, institutions, and businesses. The books are sold at FOPAL’s monthly sales and through its online site, generating about a quarter million dollars in total revenue each year. Net revenue from the sales is given to the Palo Alto Library in the form of grants to help support a variety of Library programs. 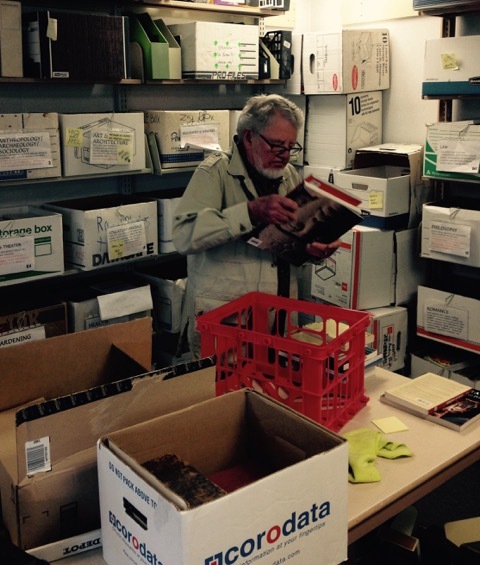 So far so good, but those facts don’t tell the story of FOPAL’s day-to-day operations: how the tens of thousands of books donated each month are processed through the FOPAL system, from being received as a donation to being sold to new buyers. In this article, we’ll take a look at the process through the ‘eyes’ of five representative books. Business Mathematics, A College Course, by Loyce Gossage, published in 1978. 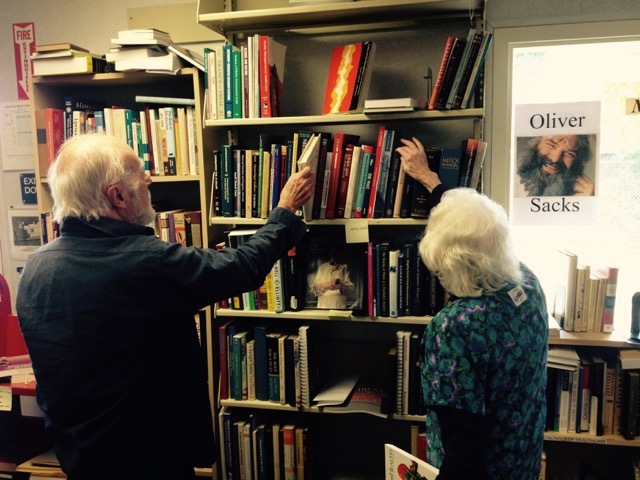 Like all of the books donated to FOPAL, these five started their journey in the sorting room of FOPAL’s Main Sale Room on the Cubberley campus. Here a small army of volunteers sorts the books by subject and adds them to one of 62 subject/section boxes in the sorting room. When a subject box is filled, it’s moved to the corresponding section on the floor of the Main Room or to FOPAL’s Children’s Annex, at the opposite end of the Cubberley campus. Over the course of a month, a busy section like Business might receive two new boxes a day on average, or about 1,200 books a month. The 40 volunteer section managers in charge of the 62 sections now begin to work their magic on the books accumulating in their sections. Not too many years ago, there was less magic involved—books that had a reasonable prospect for sales in the Main Room or the Children’s Annex were priced in the $1-$5 range, depending on condition and guessed-at value, while books that were viewed as less saleable, for whatever reason, were sent to the H-2 Bargain Room at Cubberley, where books are sold at half price—typically 50¢ or $1.00—at FOPAL’s monthly sales. Today FOPAL’s section managers are working in a more demanding environment. Most books that come through a section, unless their price is already known to the section manager or easily guessed at, are priced using online book-pricing services, such as Amazon.com, BookPricing.com, Bookfinder.com, or AbeBooks.com. These online services also provide book sales rank, allowing the section manager to gauge the book’s likely appeal to buyers. Once the look-up price and sales rank are known, the book can be assigned a price and directed to one of FOPAL’s four sales venues—online sales at Amazon, the Main Room, H-2 Bargain Room, and one of FOPAL’s three library stores. For the moment, put yourself in the shoes of the manager of the Medicine section. You are holding Pharmacovigilance, the first book on the list above. The look-up price for the book in like-new condition is $282. That’s well above the $20 price that recommends a book for online sales on Amazon (FOPAL’s online books are accessible directly through www.amazon.com/shops/grandmabetsybooks). So you earmark the book for FOPAL’s high-value online group, which will catalogue, price, and list the book on Amazon. About 5% of the books that are donated each month end up in the high-value group. Revenue from FOPAL’s online sales has been growing impressively for the last several years, now accounting for about 25% of book-sale revenue. The second book on the list, The Art of Dale Chihuly, is an attractive coffee-table book with vivid color photos. Its used-book online price is $4.00, but the Art section manager decides its excellent condition warrants a $5.00 sales price, which makes it an attractive candidate for sale in the Main Room at the next monthly sale (second Saturday and Sunday of each month). Here it may be a real treasure for a customer who will be able to hold the book in her hands, confirm its beautiful condition, and know that she is saving about $4.00 on shipping cost over ordering the same book online. Undaunted Courage, by Stephen Ambrose, the third book on the list, is a lively account of the Lewis and Clark expedition. It’s in excellent condition, and with a sales rank of 3934, should be a quick seller at one of FOPAL’s library-branch stores for $2. Which is where the History section manager decides to place it, along with the same book in paperback priced at $1 (all of the library-store books have a low sales rank and are priced at $2 for hardbacks and $1 for paperbacks). Dave Barry’s Mars and Venus, our fourth book, gave pleasure to more than one reader, judging from its dog-eared condition. The Humor section manager decides to price this paperback at $1 price and hope for the best. If the book doesn’t sell in the Main Room after a couple of months, the Humor section manager will send it off to the H-2 Bargain Room for some lucky buyer to pick it up for 50 cents. That’s a lot of chuckles and smiles for 50 cents. Chuckles are probably not what come to mind when the Business section manager picks up Business Mathematics, A College Course, published in 1978. Its lookup price of 1¢ and its sale rank over 15 million confirms that the book would have little appeal, even for someone in the field. So it’s off to the Bargain Room with this book, although the book is not alone. Of the roughly 1,200 books that come through the Business section each month, about 3/4 will be sent directly to the Bargain Room. The other 1/4 will occupy most of the section manager’s time, pricing them and deciding whether to direct them to the high-value online group, shelve them for sale in the Main Room or send them to one of the library stores. Even after a book has been priced and positioned for sale online, the Main Room, or a library store, its journey at FOPAL may not be over. A book in the lofty world of online sales can fall from grace due to rapidly shifting book prices online, in which case the book may be returned and better placed in the Main Room, or at a FOPAL library store. Similarly, a book originally placed for sale in the Main Room, or at a library store may languish there, and after a couple of months, could be sent to the H-2 Bargain Room for half-price sale. And what becomes of the books that end up in the H-2 Bargain Room? On Saturday of the monthly sale weekend, all hardback books are priced at $1 and paperback books at 50 cents. On Sunday, those prices are cut in half and customers may also fill bags for $5/bag, and 5 bags for $20. 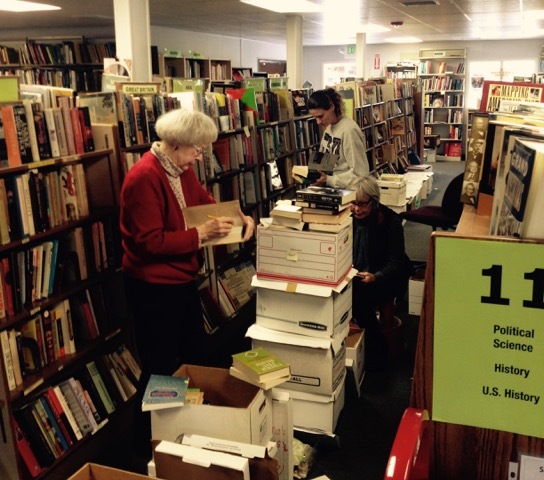 After the sale ends at 4PM Sunday, the Bargain Room is reopened to teachers and representatives from non-profit organizations to take for no charge whatever books they can haul away. On Monday evening, the public is invited to take whatever is left for free. What’s left after that is hauled away by a book recycling business operated by the St. Vincent de Paul organization in Oregon. When the dust settles, FOPAL will have collected around $20,000 in a typical month from its monthly and online sales, and the proceeds will end up enriching the Palo Alto Library. Those donated books that still have a second life in them will find happy homes and appreciative new owners. At FOPAL, no book is left behind.